John Vines Cobb and his wife Ann Pitts Cobb of Pinetops spent most of their married lives in service to that community. Although they were nominated years ago, because of Twin County policy, elected officials could not be inducted while still serving in the elected office. Therefore, Vines had to retire before he could be considered. Ann and John met and married and raised four children. Ann Pitts Cobb, a Brooklyn native moved to the area upon her marriage and began teaching music at Pinetops elementary school and was the Christian Education Director at the First Presbyterian Church in Wilson. She had completed her education at Atlantic Christian College, now Barton, and East Carolina University. In 1959 she moved up to teach at South Edgecombe High School for four years. During the 1960s she was Music Supervisor of Wilson County schools. In 1970 Ann returned to Edgecombe County where she spent the next 24 years as music teacher, choral director, Spanish teacher, and English as a Second Language teacher. She was selected as the Carver Elementary School Teacher of the year. In addition to teaching in public schools for almost 40 years, Ann also supervised many student teachers. She was the choir director of the Pinetops Presbyterian Church for over 30 years, and she was director of the community chorus in Pinetops that performed in the Pinetops Centennial and numerous Easter Sunrise Services. Ann touched many lives as a voice teacher and as a wedding director for many area brides, but perhaps her most far-reaching community work was with the North Carolina Symphony as she served on the local symphony board, twice as president. Ann was also active in the North Carolina Music Educators Conference, the Delta Kappa Gamma Sorority, The Edgecombe County Arts Council, the Edgecombe County Human Relations Committee, Friends of the Library and in various positions at Pinetops Presbyterian Church. 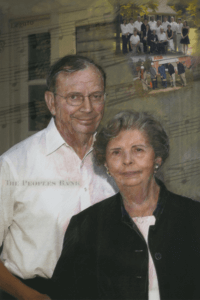 While Ann was bringing music to the people in Edgecombe County, her husband Vines was helping them with business as Vice-President of Peoples Bank and Trust in Pinetops for 35 years. A graduate of UNC with a business degree, Vines also served in the US Air Force during the 1950s. He also served as an active political leader serving in many roles for over 40 years. He has been on the Pinetops Town Council for nine years, the Edgecombe County Board of elections for 8 years, and Edgecombe County Commissioner for 12 years, two of those years as Chairman, on the NC State Board of Commissioners, the Edgecombe County Board of Education for 8 years with two as chairman. Like Ann, Vines was very active in the Pinetops Presbyterian church including service as superintendent of Sunday School. He was also a member of the Pinetops Lions Club, the Edgecombe Community College Foundation Board, the Pinetops Development Corporation, and the Tarboro Edgecombe Chamber of Commerce. That group awarded him the distinguished Citizen Award in 1997. But perhaps to most people, Vines is remembered as Mayor of Pinetops, a position he held for sixteen years, retiring in 2015. As a testament to their focus on education, all four of the Cobb children have been educators in Edgecombe County serving as music teacher, football coach, guidance counselor and principal. Ann died in 2011 and Vines in March 2016.